Rocco Baldelli spent seven years in the big leagues before calling it quits after the 2010 season. 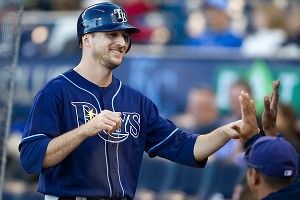 Upon his retirement, the Tampa Bay Rays brought their former first-round draft pick into the front office, where he now serves in the role of baseball operations special assistant. We tracked down Baldelli after a panel at this year’s MIT Sloan Sports Analytics Conference, and asked about adjusting to a new role, his early embrace of analytics, and the benefits of working with an open-minded manager. You work in a front office that’s limited in terms of high-level baseball playing experience. Did you feel that was something you could bring to the table, having played in the majors very recently, then bringing that experience right upstairs? Maybe Andrew [Friedman] was thinking that. At the time I was just interested in working in the front office. But I’ve always been interested in this aspect of the game. When I was a young player, I would talk with [Rays scouting director] R.J. Harrison about things. This was when I was at A-ball. That’s not usual for a player. No. I was more focused in what was happening on the field, of course. But I was interested in going through the process, learning more — even negotiating a contract. I did that with Andrew. Over sushi. Most players, I’m sure, aren’t super-interested in things like that. But I know I was. Did you try to use that kind of thought process as a player? Maybe study hot zones as a hitter, things like that? I think I would say I was an open-minded player. If you’re not open-minded to it, it’s not going to help. Some players are reactionary athletes; maybe it’s a good thing they don’t clutter their minds with excessive information. I’d be interested in trying to find ways to work with players and make them better through some [advanced concepts]. But I don’t know if we’re completely at that point yet. Having played with several members of the current Rays team, are you able to serve as a liaison between the front office and the team? Or do you stay away from the clubhouse? I don’t spend too much time in the clubhouse. Sometimes it’s sensitive, depending on what you want to talk about, being a member of the front office talking to a player. But I do go in sometimes. These are my friends, guys I spent a lot of time with. I’ve known a lot of these guys for a long time. I don’t try to eliminate contact, I would never do that, because these are people I enjoy being with. But sometimes when dealing with baseball issues, it’s best to just let the players do what they do. What about Joe Maddon — having been around him for a few years, is the idea of his open-mindedness to new ideas and advanced metrics for real, or is it overblown? It’s definitely not overblown. It’s the essence of him. The way Joe works with Andrew and everyone else is very unique. Our staff is built around Joe being open-minded. I’m not saying that old-school coaches and managers can’t win. There are some phenomenal baseball minds out there who’ve been around for a long time. But with our young group, and the way we’ve had to build our organization, Joe is a perfect fit. This being your first time at this conference, what’s your impression of this whole scene? Just sitting there, listening to Bill James talk … the things that come out of his mouth, they’re not normal. They’re not things that you normally think about when you sit around watching a ballgame. That’s how this thing started way back when, coming up with unique, really different ideas. Most of those ideas might not turn into anything. But some do, and that’s where some of these advantages come from. So with the Rays’ whole low-payroll philosophy, is the idea to hoard enough money to steal Bill James from the Red Sox? [Laughs] I don’t know if we can afford him!